Columnist’s note: Many northern Amish spend the holidays or coldest months of a northern winter in the south. 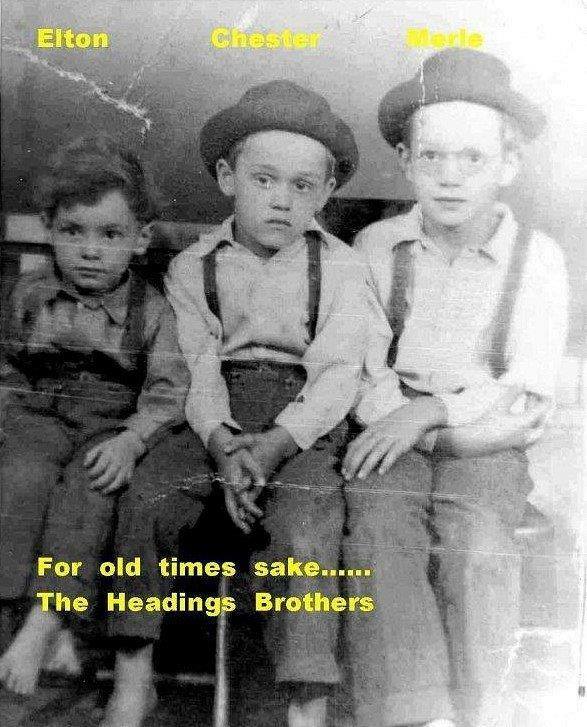 My friend Merle Headings (no longer Amish) remembers how excited he and his family were to make their first trip. This is the first of a 2-part guest column as told by Merle to Deven Eileen Lewis. Photo taken the same year as the trip to Florida. Thanks to Merle Headings for this precious photo. It was 1944 and I was nine years old. My family and I lived in an Amish community in Plain City, Ohio. My parents, Abe and Orpha Headings, were farmers who had three boys; me, Merle, nine; Chester, seven; and Elton, three. We had five churches in our community. Three were horse and buggy Amish, one was Mennonite, and our church was Beachy Amish. Preaching and singing during church was in High German, which meant I understood very little. Our church was like horse and buggy Amish churches except we were allowed to have cars, (as long as they were painted black) and we used electricity. I remember when Dad bought a 1939 green Dodge and the bishop gave Dad two weeks to get the car painted black. At home I got up early every morning before school and headed to the barn to milk cows, and then again every evening after school. That was my life until my parents began to grow restless. Some of the Amish within our community were beginning to travel to a small town in Florida called Sarasota. I was ecstatic when my parents announced that we were going to Sarasota for a month. There were plenty of obstacles: we were in the middle of World War II, and all gasoline was rationed. You had to have government stamps in order to buy gas. Second, you were not supposed to go out of state in your car, so we couldn’t drive our car to Sarasota. This did not deter Dad. He soon found we could travel by train, which we could get 100 miles away in Cincinnati, Ohio. My mother’s brother agreed to do our chores and even drove us to Cincinnati in our “black” two-door car. We boarded the train while it was still dark. The train was noticeably warmer than our black Dodge. My eyes first fell on the seats, which were covered in red velvet with a delicate design etched into the fabric. I ran my fingers softly across the top of the chairs. The windows were big and we could soak up all there was to see. There was no sleeping that first day on the train, except for my little brother Elton. We were simply too excited and looking forward to warmer weather in the south. With our eyes glued to beautiful mountain scenery, we quickly found that when the train went around a curve, we could see the steam engine ahead and smoke. Traveling through Georgia, we saw shack houses with smoke billowing out of chimneys, and began to smell the pine trees! We had never smelled anything so fresh and clean. We arrived in Sarasota late in the evening, the final leg traveled by bus. We didn’t really know anyone. The first time we went to the beach, I was amazed when I saw the pristine white sand, and looked out over the water that had seemingly no end in sight. There were oranges and grapefruit aplenty that you could buy with very little money! Back in Ohio, they cost too much and were nothing compared to the oranges that we picked right off the trees. During our stay in Florida we ate a lot of oranges and went to the beach as often as we could. Back then Sarasota was not very big, with only two traffic lights compared to the hundreds today. So when we weren’t lazing about on the sand or cooling off in the water, we were having a grand time driving from Sarasota to the muck farms east of town. Once there, we bought the best celery and other veggies. My mother, Bertha, holding me as an infant, probably on a Sunday dressed up for church. 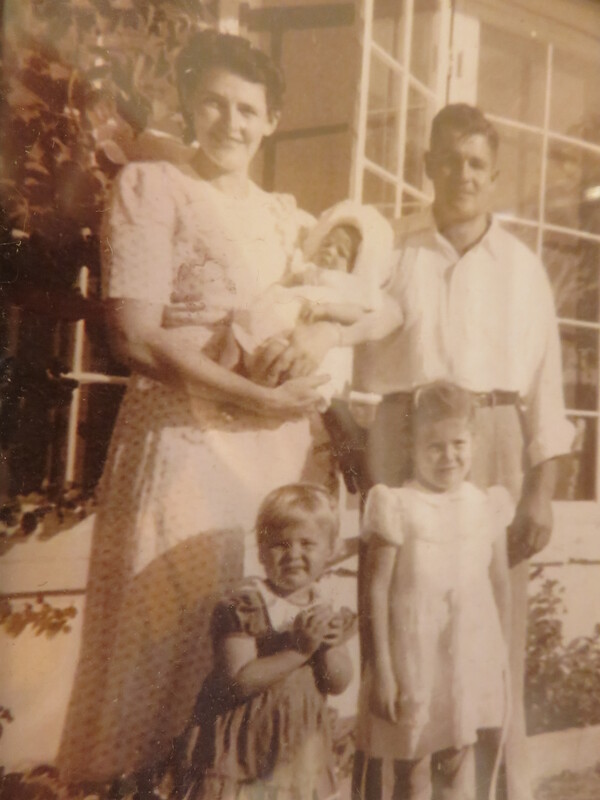 My Dad, Vernon plus big sisters Linda (Pert) and Nancy, l to r. My little brother, Terry, was born four years later and lives in north Florida. One reason I (Melodie) loved Merle’s description of their trip to Florida in 1944 is that my own parents followed the trend among certain Mennonites and Amish and went to Sarasota for their honeymoon in January of 1946. Five years later, I was born there when they spent six months back in their beloved paradise. The interest in starting Mennonite communities and churches in the southeast continued for many years, and is described in Roots & Branches: A Narrative History of the Amish and Mennonites in Southeast U.S. 1892-1992 by Martin W. Lehman, Cascadia Press. Any early trips you recall as a child? Send to me at anotherwaymedia@yahoo.com or Another Way Media, P.O. Box 363, Singers Glen, VA 22834. This post reminded me of photos I found in my parents’ collection showing my dad and his Mennonite friends on a trip to Florida. I don’t know whether they made it to Sarasota or not, but I saw palm trees and the interior of a church where dad and his bachelor friends “played” church behind the pulpit. I’d venture to guess they made it to Sarasota. I remember you posted about that trip. I wish I was there now: 6 degrees with a stiff wind. I’m thinking of looking into going there for a month in coming years after I retire like my parents and so many of their friends and relatives did. Oh, wait, you already live there. Smart. Have a great sunny day, I hope, Marian. This is so fascinating, because my great-grandfather took his family to Sarasota as well, although they went to actually live and work there. It did not work out and when he brought his family back to Ontario, they were the very definition of ‘poor’. But my grandfather always viewed Florida as a type of ‘Promised Land’; and reminisced dreamily. . .
I’m glad you enjoyed this. Yes, I think for many Florida was the “promised land.” I suppose you saw my footnote on the article, that my father and mother tried to move there then in 1951, spent 6 months there, and then I think homesickness for their sisters and brothers and many others compelled them to move back. Daddy worked down there that winter, I’ll have to ask Mom again what he did exactly. I know the OB doctor and Dad were discussing raising chickens as the doctor tidied up after my birth, –Dad was in the delivery room (which ordinarily they didn’t allow back then, right?) because the doctor was late getting there and Dad almost had to deliver me. Thanks for commenting, Darla. I so enjoy reading memories from the past. Thank you for sharing Merle’s recollections with us!